I know, doesn't look like much. 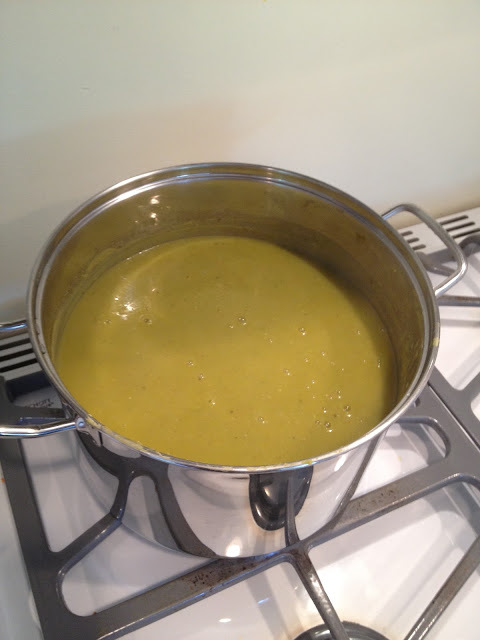 I'm not sure there's much you can do to make pea soup look visually appealing. But I just love it and I always have. I made two versions of this one again too - a meat version and a vegetarian version. I started with onions, carrots and celery, sauteed in a little butter until soft. Then I added the dry split peas and some water and broth, a little salt and pepper, and some bay leaves, and simmered it all until cooked and soft. Then I took out the bay leaves and pureed it all with my hand blender until smooth. At that point the meatless version is done - season a little more if needed and serve. We had a ham bone left from easter, so after taking out half the soup for the vegetarian version, I dropped the ham bone in and let it simmer for a couple hours to get all nice and porky.